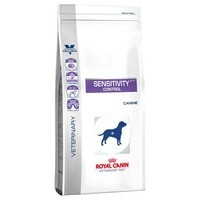 Royal Canin Sensitivity Control Dry Food for Dogs is a complete and balanced hypoallergenic vet diet for dogs with Adverse Food Reactions (AFR), food allergies or food/ingredient intolerance. Made with a specially selected source of hydrolysed proteins that have been chosen to help reduce the risk of your dog having an allergic reaction, Royal Canin Sensitivity also contains high amounts of biotin, niacin and zinc to help strengthen your dog’s natural skin barrier, and help protect them from external irritants. Royal Canin Sensitivity Veterinary Diet contains a careful balance of nutrients and fatty acids that will promote a healthy digestive system by cultivating the good bacteria in your dog’s system. Recommended by our Vet after our 9 year old Labrador suffered several stomach upsets. Nothing else we tried cleared her runny stools up completely so this has been a godsend. She has never enjoyed her food so much and it actually smells pleasant unlike some other foods. Excellent product that my Norfolk Terrier finds perfect for his sensitive digestion! This food has literally been a life saver for our Labrador. At 12 years old he lost one third of his body weight in 8 weeks. Severe gastritis led to him being unable to keep any foods down, even scrambled eggs. The vet recommended this food and we discovered that by soaking it in cold water overnight he could keep it down. Coupled with his prescribed medications, this food has given him a new lease of life. Imagine two Mastiffs with diarrhoea, well thanks to this product, those days are over! I have a 5 year old Westie who suffers with numerous allergies (including rice, potato, corn, wheat, soybean, barley and oat! )and I was really struggling to find a dry food that would suit her but am happy to say that I found one in this absolutely superb product. She took to the biscuits readily ~ this was a worry for me because she can be a little bit "picky" with her food. I honestly can't praise this food highly enough and would most certainly recommend it. I wouldn't dream of purchasing it from anyone other than VETUK either because they NEVER EVER let you down! FANTASTIC PRODUCT & SERVICE! My King Charles Cavalier suffered from colitis and having tried various Vet recommended brands, I finially tried Royal Canin SC. Very quickly, all his troubles disappeared. For the last 18 months on Sensitivity Control he has had no problems. I wouldn't feed him on anything else! My vet recommended this food after my Labrador started having problems with vomiting and loss of appetite. He hadn't been interested in his food for somt time. As soon as I opened the bag of SC21, he couldn't wait to eat. He now looks forward to his dinner again, he has stopped being sick, and his coat has regained its gloss. It must smell good to dogs, because I found my other dog raiding the bag trying to steal it, so it has to be kept in a secure plastic tub. It is expensive, but it's much cheaper for me than spending money on vet bills! My collie has been on this for the last two years after my vet recommended it. After years of regular stomach upsets and trying different foods I have finally found a food that he enjoys and his stomach is a lot better. My Labrador was put on this food because of his food Intollerance/Allergies.It took us a while to find a food that suited him and now we would not use anything else. My boxer dog was plagued with bouts of very severe colitis. Since my vet recommended this food she has never looked back. This food was first recommended to me several years ago by my vet for my retired greyhound. I've now owned 4 greyhounds over the past ten years and have fed them all on Sensitivity Control as I have found that greyhounds do have a tendency to 'delicate' digestive systems. When the formula changed from fish to duck I was slightly concerned but needn't have worried because it is fine - In fact it smells much more appetising than before. I have fed my dog this product on and off for the past couple of years. When I first adopted my dog over ten years ago we tried her on every type of food available and she had reactions to all of them I was so happy when she tried this product and had no sickness or digestion problems with this at all I would highly recommend it. Fantastic stuff. My labrador had real problems with upset stomachs before this was recommended to me by my vet. I have also recommended it to other dog owners and would have no hesitation in recommending it for anyone whose dog has a sensitive digestive system. At last I have found a dog food that suits my staffie,that has so many allergies .Definitely worth 5 stars. A first class food. Very good if dog has contracted gastro bug.Also very good if dog has sensitivity to other foods. I would not be without some in stock. Very useful if you get a new pup/dog that is unsettled with change. Would give this 10 out of 10. This is the only food which helps my highly sensitive malamute's stomach! I have also noticed that my dog has nice breath & healthy looking poo (yes there is such a thing! ).